Check availability, learn more and reserve your stay here. If you liked this small house you’ll love our free daily tiny house newsletter with more! like the layout and the look of this little home. always a little disappointing with tiny homes on foundations in this size range that do not consider one of the many variations of stairs with/without storage that you have shown Alex. i understand the use of loft for space saving just not the ladder in a “grounded” home. Thanks Doc, yeah, too bad no storage for the staircase. I would have loved to see that implemented here too! Company should never see a bedroom. That is private/personal. Loft will do just fine, thank you. 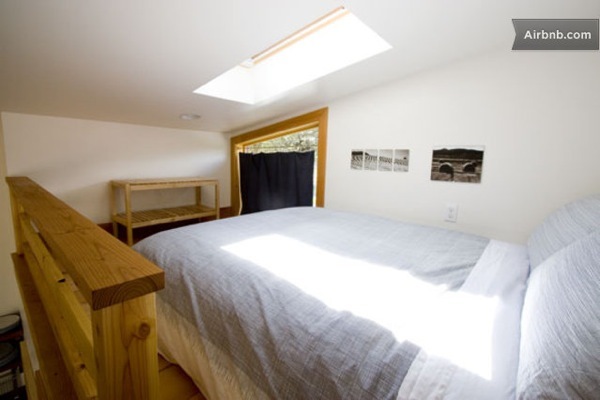 The bedroom has a pocket door…privacy and space saving.